REI came to my team with a unique problem. They didn't want to increase sales, as most retailers would, they were worried about the future of their business when companies like Amazon would be able to out-compete them on what had been key differentiators in the past: price, availability, etc. So how do you make a website better when it's already working well? What we discovered was that REI customers were not coming to REI.com, or their stores, with the sole intention of purchasing a product. 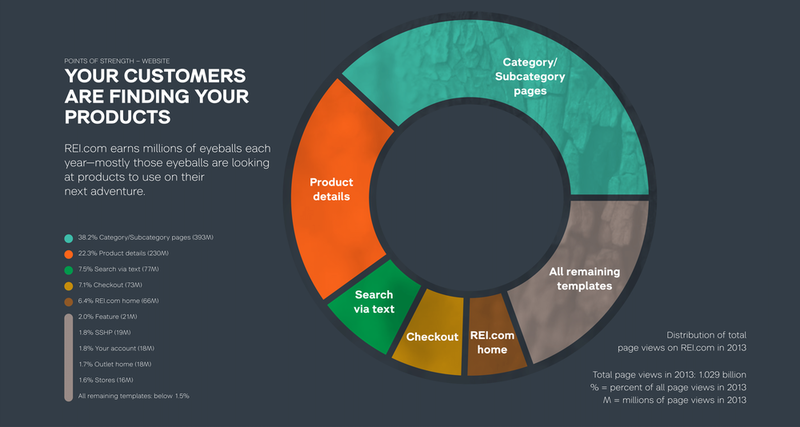 In fact, very few people chose to purchase from REI if they were simply looking to buy a specific product. The majority of people who visited REI were there to learn. REI had built a reputation of being a knowledgable guide for outdoor adventure through years of what we could only hypothesize as extraordinary hiring and business choices. This had resulted in their customers expecting a very specific experience on their way to the checkout counter, and eventually the mountains. 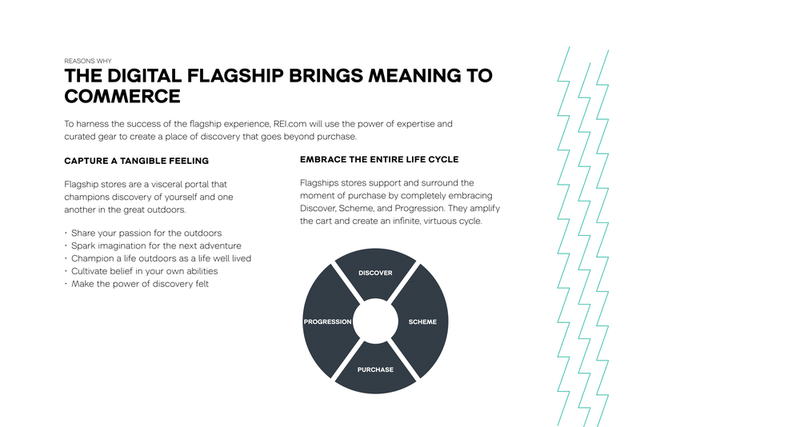 We discovered that REI had an incredible flagship store experience, where customers discovered gear, schemed their next trip, purchased the correct product for the journey, then progressed their skills until they needed to return for a better, or less worn, piece of gear. 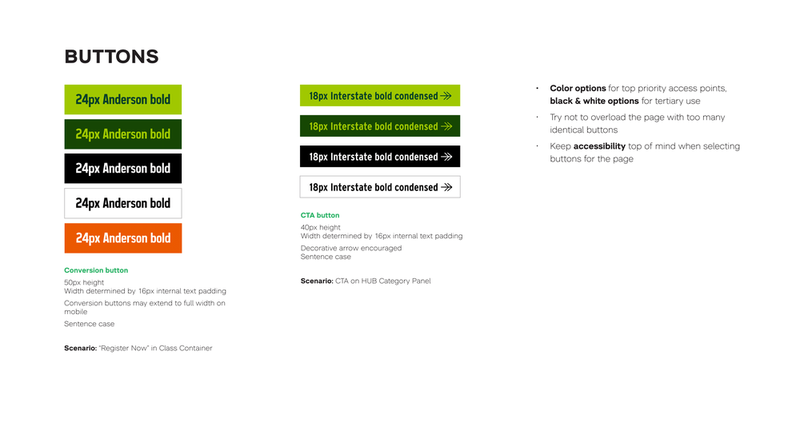 Yet the REI.com experience was not the same. It was a place to buy gear, not a place to become a lifelong seeker of adventure. A place where anyone can envision what they are capable of, and discover the expertise, gear, and confidence to make it happen. 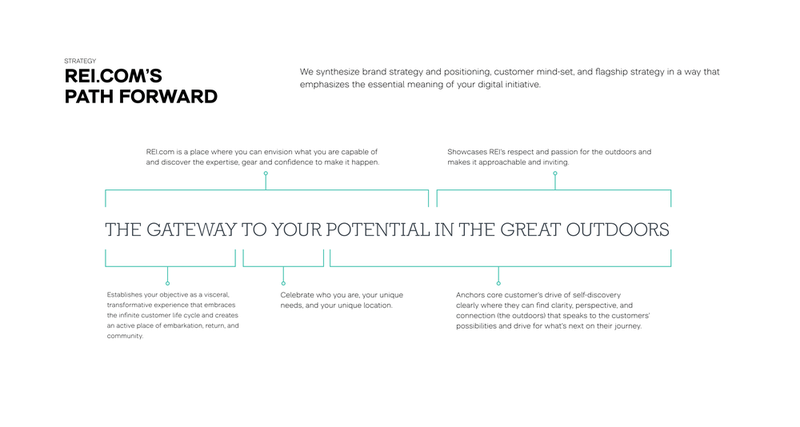 The gateway to your potential in the great outdoors. 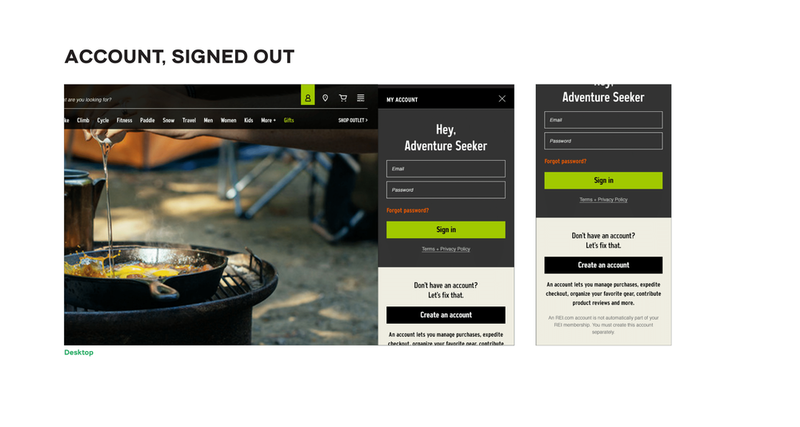 Once we all understood why people chose to visit REI, we focused on translating the in-store flagship experience into digital. When you walked into a flagship store you couldn't help but notice that every section of the store had a knowledgable Greenvest (REI employee and outdoor enthusiast) who could assist in finding the best gear for the job. 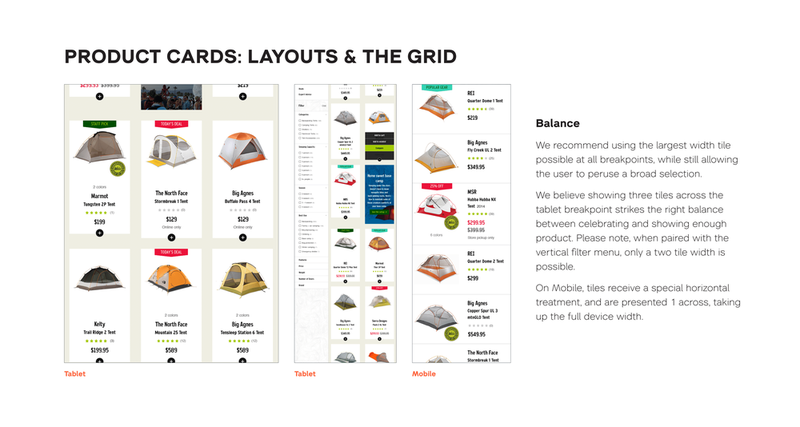 To bring this experience to the web we taught REI to blend product and knowledge-based content. Put critical decision making information, as well as inspiration, directly next to products the information relates to. This could be anything from capturing their location and showing them hikes near them, to placing a pull quote and a link to one of the thousands of articles that had been written by their employees about real use of the same products the customer is shopping for. We taught REI to know their digital customers, to create an online experience that could tell their customers about free upcoming classes to decrease chance of injury, or highlight a beautiful weekend coming up and a new hike in their area. 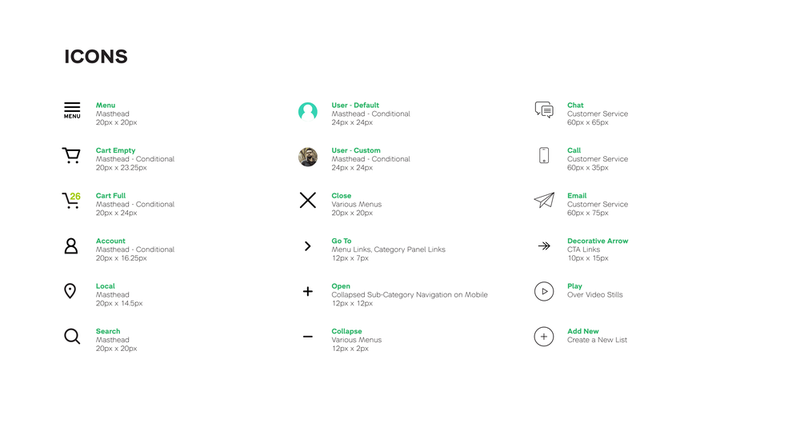 And after we had successfully laid out the digital flagship design strategy to strive for over the coming years, we jumped into the depths of the details. We taught them how to put it all together, along with the basics and importance of responsive web design, accessibility standards, information hierarchy, and navigation. 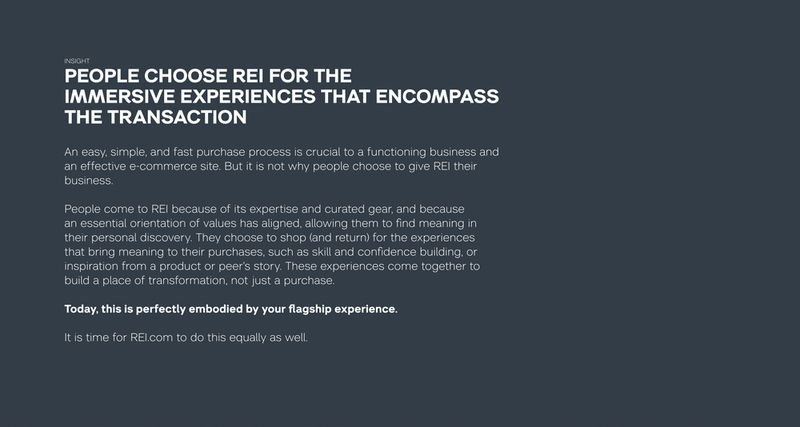 We taught REI why they were different, why they had such incredible brand loyalty, and then taught them how to take those values and translate them into an accessible, seamless digital experience that would equally serve customers throughout every stage of their lifecycle. You should check out the site now. It’s not all in there yet (they’re still working on it), but it’s a beautiful experience.